At around 4 p.m. on Sunday, Sept. 24, with weather more befitting a day at the beach than an NFL football game, Jake Elliott lined up to attempt a 61-yard field goal. Make it, and the Philadelphia Eagles seize a dramatic victory over the rival New York Giants while simultaneously supplying a euphoric mood for most of the Delaware Valley. Miss it, and the Birds might lose in overtime, thus ruining the mojo of millions of local football fanatics. By now, everyone knows Elliott split the uprights — with about a yard or two to spare in length, and even less in width. Send that pigskin on its path with a bit less force or a tad less accuracy, and the delirious crowd inside Lincoln Financial Field belts out sounds of distress and probably a few expletives directed toward the unassuming Elliott. Among the hordes of zealots holding their breath in anticipation were La Salle High School placekickers Dan Karrash and Jake Gandolfo. Karrash, a senior, sat surrounded by a bunch of friends; Gandolfo, a sophomore, shared the moment with his family. When the kick went through the uprights, and the officials, after what seemed an interminable amount of time, raised their arms to the sky, Karrash and his buddies, and Gandolfo and his family, erupted in jubilation. Earlier, with 51 seconds remaining in regulation, Elliott had booted a game-tying, 46-yard field goal. Miss that, and the game was over. Thus is the reality of a football kicker’s mindset. Karrash and Gandolfo are parishioners at Mary Mother of the Redeemer Parish in North Wales. Having met through their parents’ friendship, the two share much in common. They both possess strong soccer pedigrees that they discarded after grade school, both play baseball at La Salle, and neither could have imagined becoming a high school kicker. Although Gandolfo did some kicking in eighth grade — he kicked off and made an extra-point on his only attempt — Karrash had literally never kicked a football before trying out for La Salle’s freshman team. After honing his skill as a frosh, Karrash backed up junior varsity kicker Mike Wells as a sophomore. He then took over the JV job as a junior while also kicking off for the varsity. This season, after having two extra-point tries blocked against North Penn and missing two of three field goals against McDonogh High School (Md. ), Karrash has been perfect. When Karrash missed the second attempt against McDonogh late in the game, it prevented any chance of an Explorers’ victory. That’s when Karrash had to channel the wisdom of Wells and “walk the talk” about his life philosophy of maintaining balance during times of success and struggle. “There’s no getting around it,” said Karrash. “Kickers are going to miss kicks. It comes with the job. How you respond to those kicks is what makes the difference. It was a great learning moment for me. Earlier in the Eagles’ game, Elliott had misfired on a 52-yard attempt. He somehow pushed that disappointment out of his arsenal and replaced it with confidence to do what he knows how to do. After McDonogh, La Salle coach John Steinmetz told Karrash to remain focused, learn from the mistake, and get ready to kick against the Catholic League. Karrash responded. The following week, he crushed a 39-yard field goal and six extra points in a non-league victory over Malvern Prep. In two Catholic League contests against Archbishop Carroll and Archbishop Ryan, Karrash has scored 15 points without missing a kick. Where Karrash attends college is still undecided. He has prepared a highlight film and also walloped kicks as far as 58 yards at an invitation camp at Harvard and 55 yards at a similar camp at Notre Dame. He has received Division I interest from Notre Dame, Penn and Columbia. Like Wells did for himself, Karrash has tried to mentor Gandolfo. On Sept. 23 at Plymouth-Whitemarsh High School, Gandolfo finally realized his first varsity experience. After the Explorers had just increased their lead to 45-0 over Archbishop Ryan in what would ultimately end up 45-7, Gandolfo was summoned to kick off. Looking like a seasoned veteran, Gandolfo calmly sprinted onto the field, lifted his arm, approached the tee, kept his head down, boomed a kick that had a minimal return, retrieved the tee, and causally jogged back to the sideline where a few La Salle players and coaches offered congrats. If Gandolfo can imitate his junior varsity production, he is headed for a successful varsity career. So far, Gandolfo has attempted one field goal and nine extra points and made all of them. Gandolfo attributes much of his success to Karrash. The Eagles’ Elliott is only keeping a spot for the injured Caleb Sturgis. Karrash is maintaining the position until replaced by Gandolfo. Two years from now, Gandolfo will do the same for someone else. In all likelihood, Elliott, Karrash and Gandolfo will not become household names. Outside of legends like Adam Vinatieri and Scott Norwood, there are very few memorable kickers. Vinatieri, still playing at the age of 44, made two game-winning kicks from 48 and 41 yards, respectively, in the final seconds to give the New England Patriots the 2001 and 2003 Super Bowl titles. Norwood missed a 47-yarder at the buzzer that prevented the Buffalo Bills from beating the New York Giants in the 1990 Super Bowl. Enormous pressure. You make some; you miss some. Either way, you keep on keepin’ on. It takes a special kind of confidence to shoulder such a potentially massive responsibility. 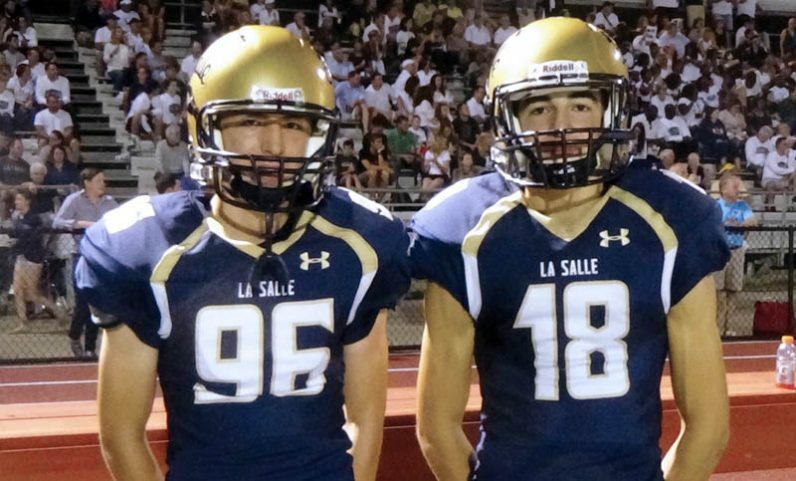 La Salle High School has two guys who are willing to be the hero or fall guy. At this stage of their careers, that’s more than good enough. Good article about two Explorers.